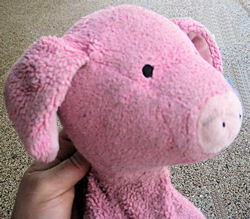 I am looking for a pink pig that is EXACTLY like the one my 3 year old great-niece has. They got it at Pottery Barn, and it was one of several in a series or set. It was just a special promotion at the time. My little niece carries “Pink Pig” with her wherever she goes. It is getting very worn, and we are afraid it’s going to fall apart soon. Three is too young to understand why Pink Pig isn’t able to play with her anymore. 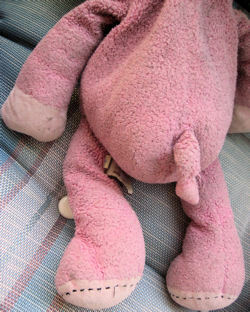 Pink Pig has become the Velveteen Rabbit. It is real to her. She talks to it, explains things to it, sleeps and eats with her, etc. I would be very grateful if anyone has or knows where to get a little pink pig. You can tell how “worn” Pink Pig is getting from the photo. I hope that through your service this little one can get another pig to love. Thank you for all your help. We have found “Pink Pig” but may also bid on the one on ebay to have an extra one tucked back in case of an accident with the current pink pig!